Mara Brennan is about to unravel. Three days after her 28th birthday, her boyfriend dumps her, leaving her with nothing but a basement apartment, a futon and a pile of unpaid bills. Mara realizes it’s time for an identity makeover. 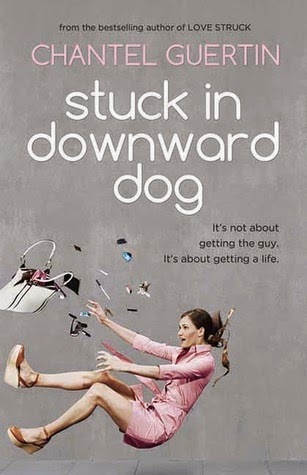 Navigating the dueling worlds of yoga and cosmetic surgery, gourmet dinners and Frankenberry cereal, etiquette handbooks and too-helpful loved ones, Stuck in Downward Dog is Chantel Guertin’s unforgettable comic debut about how to get unstuck when you’re caught in a rut. This book is one woman's outlook on her own life after she feels she hit rock bottom. Some would say it had to do with a guy, but I say it was all about her and her relationships in general. You really need to have a good relationship with yourself before having it with anyone else. Mara learns this lesson in the story. This book was so easy to read, not only for the modern feel to it but for the often humorous look at things in life. The story felt very contemporary and I really needed that at that moment. I think lots of people are going to agree that this is a great read! Sounds like a great read! Thanks for this post, i need some good reads for summer.